Land of White Gloves? 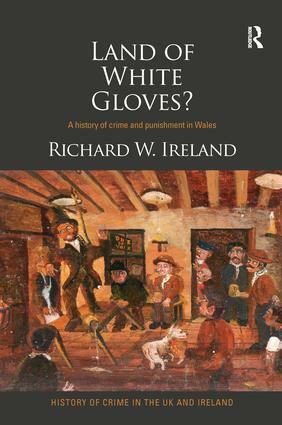 is an important academic investigation into the history of crime and punishment in Wales. Beginning in the medieval period when the limitations of state authority fostered a law centred on kinship and compensation, the study explores the effects of the introduction of English legal models, culminating in the Acts of Union under Henry VIII. It reveals enduring traditions of extra-legal dispute settlement rooted in the conditions of Welsh Society. The study examines the impact of a growing bureaucratic state uniformity in the nineteenth century and concludes by examining the question of whether distinctive features are to be found in patterns of crime and the responses to it into the twentieth century. Dealing with matters as diverse as drunkenness and prostitution, industrial unrest and linguistic protests and with punishments ranging from social ostracism to execution, the book draws on a wide range of sources, primary and secondary, and insights from anthropology, social and legal history. It presents a narrative which explores the nature and development of the state, the theoretical and practical limitations of the criminal law and the relationship between law and the society in which it operates. The book will appeal to those who wish to examine the relationships between state control and social practice and explores the material in an accessible way, which will be both useful and fascinating to those interested in the history of Wales and of the history of crime and punishment more generally. ‘This fascinating history of criminal justice in Wales tells the story of the complex and constantly evolving relationship between authority and community over the past thousand years. Introduction 1. The Middle Ages: Victims, Lords and Kings 2. Assimilation and Difference 3. The Eighteenth Century: Courts, Curses and Confinement 4. The Nineteenth Century: The Uniform – and the White Gloves 5. The Twentieth Century: Radicalism, Drugs and Sheep Concluding Remarks. Richard Ireland has been researching the history of crime and punishment for many years and has published widely in the area. Richard is a founding committee member of the Welsh Legal History Society and a member of the Board of the Centre for Welsh Legal Affairs. He has also contributed to a number of radio and television broadcasts.